A few months back, we blogged about our first cost management feature: Monthly cost trend. It allows you to see how much you have spent in the current calendar month and also shows the projection of the spending until the month's end, based on your spending in the last 7 days. Now, we're moving on to answer a second question that's likely crossed your mind: Why is lab spending so fast? In order to help you get a clear answer more productively, we have released a new feature so that you don’t have to scratch your head to find the answer. The feature makes your life easier by showing you the month-to-date cost per resource in a table. We have also released another feature that allows you to set the target lab cost for the current calendar month. 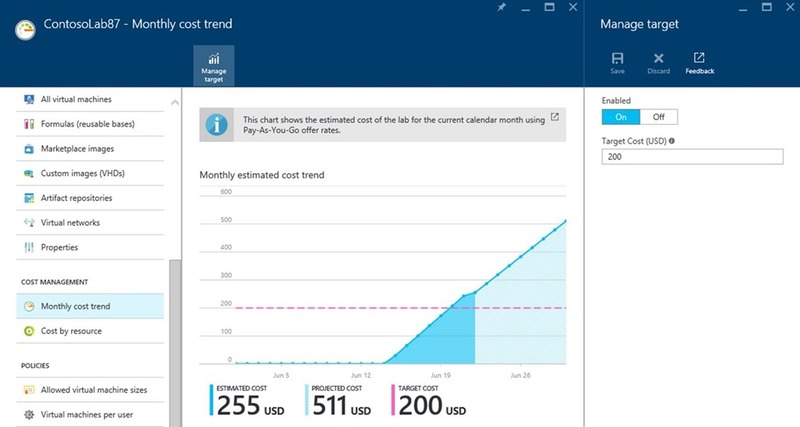 The target cost will appear in the “Monthly estimated cost trend” chart, which will help you to track the month-to-date lab spending relative to the target cost for the current month. The projected lab cost, together with the target cost, will help you to easily identify if you are going to blow up your budget for the month. For more details on these features and what’s coming next, please check out the post on our team blog. Please try the new features and let us know how can we make them better by sharing your ideas and suggestions at the DevTest Labs feedback forum. If you run into any problems with the features or have any questions, we are always ready to help you at our MSDN forum.